At the annual banquet of the Active Hose Company of the Mount Morris Fire Department, two members were awarded citations for 55 years of service. The citations were presented to Jerry Gehrig and Chuck Burch. 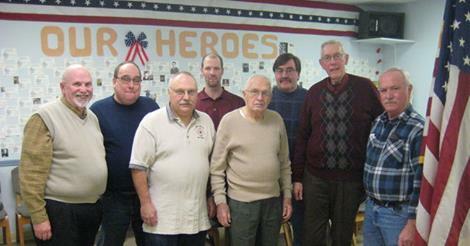 Pictured are, from left, Bob Ossont, department secretary; Dave Brown, lieutenant; Gene Gregg, department treasurer; Rodney Cobb, captain; 55-year member Chuck Burch; Don Hopkins, council representative, 55-year member Jerry Gehrig; and Dean Smith, department chief. The banquet took place in January.